Ok, enough of egg cartons. Since I shoot b&w film in 4x5 and monochrome in the 5D, it's recommended to do the tests for the dynamic range of your film and digital camera. 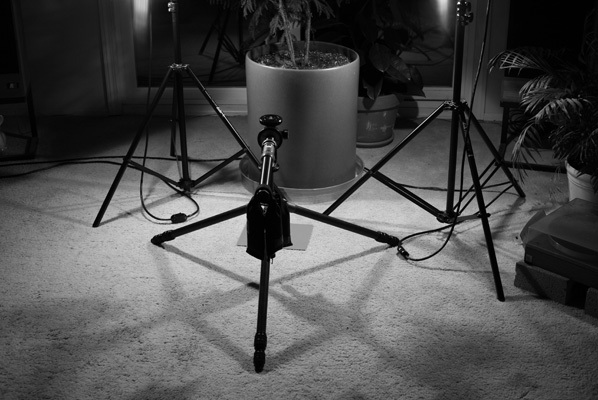 So, I used the setup above with two Lowel Tota Lights on an overcast day, placing the gray card on the floor. I used a 50mm lens for full coverage of the card with centered	weighted averaging since it is uniform color. Readings were checked with a Sekonic L-358 light meter for for incident and reflected light. I have read the dynamic range of monochrome for the 5D is about 11 f-stops at 100 ISO, which exceeds film, but more practically is a 7+ dynamic range, comparable with most black and white films. I've also read that the dynamic ranges fall significantly to 4-5 f-stop over ISO 200. While I didn't want to perform a comprehensive test to verify this, I did want to see any obvious differences at ISO 100, 400 and 1600, the three most commonly used speeds. The test was made setting the minimum focusing distance with the 50mm lens to get the gray card in the full frame of the viewfinder. I used f4, f8 and f16	for the different speeds to make the shutter speeds nearly the same each of the nine zones across the three ISO ratings. I didn't shoot for zone 0 or 10 because initial tests showed no visual difference between 0 and 1 and between 9 and 10. The histogram showed 1 was almost pure black and 9 almost pure white. After setting zone 5 to get the middle gray setting, a full range was run from zone 1 through zone 9 at ISO 100, then repeated for ISO 400 and for ISO 1600. The raw images were converted to tif in Canon's image processor and the tifs converted to 600x400 high quality jpegs for the Web in Photoshop. You can see the test images and read the conclusion.